Eek!! I am so excited about this year’s Oh Mon Dieu! This awesome challenge is brought to us by the lovely ladies who also organize the monthly Nail Art Ideas Linkup. Jacqui (from Craftynail), Lindsay (from Nail that Accent! ), Jemma (from Eeeek! Nail Polish!) and Brijit (from Brijit’s Digits) work so hard to bring together nail enthusiasts from all over the world. The NAIL linkup was the first community I joined when I first started blogging two years ago and I have participated ever since. I participated in my first OMD challenge last July and it pushed me to my limits! Not only did I post once a day but I attempted at least three or four techniques I never thought I would touch with a ten foot pole! These girls have a knack of bringing out the real creative side of the nail junkies without imposing a ton of rules but still providing guidelines so we are not completely lost! The first prompt is teal! Okay, first, let me say, I could not find any of my teal polishes! The one I wanted to use was an old Milani polish I finally parted with. It was such a beautiful polish. I am slowly but surely moving through my old Milanis and I feel absolutely gutted every time I use them. I knew our relationship would not last forever but I certainly wish it did! 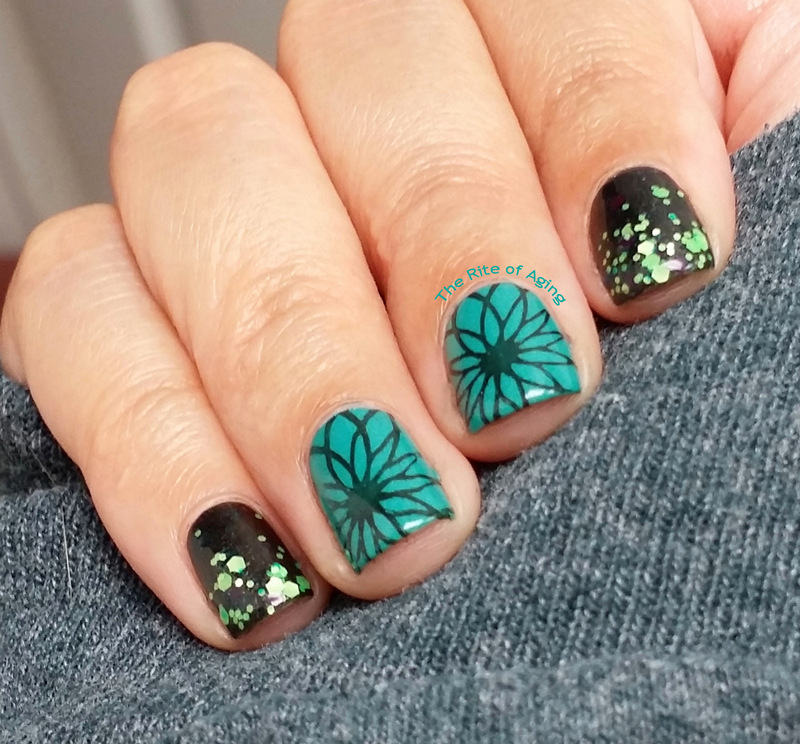 I am starting out nice and easy and RA-friendly with a cute, neon glitter gradient and some simple stamping! Hope you like it!